Homes for sale in Strathy Hall feature a lovely bricked entrance and nicely landscaped streets. 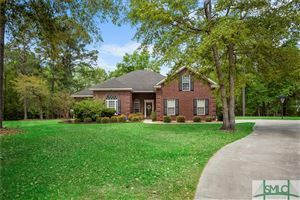 Located in Richmond Hill in Bryan County, Georgia, this community has some homes with deep-water access. Many streets in this subdivision offer dramatic views of the Intracoastal Waterway and marshes. Prices can range from $135s to mid $800s. Strathy Hall’s wooded acres are built on a long history of plantation living. It's history dates back to 1756 when the land was given to Captain James MacKay as a land grant of 1,400 acres along the Ogeechee River. He named the plantation, Strathy Hall, after his ancestor's estate in Scotland, Strathnaver. It was eventually developed into a profitable rice plantation. George Washington McAllister purchased the plantation in 1817 and built the present antebellum plantation house around 1838. 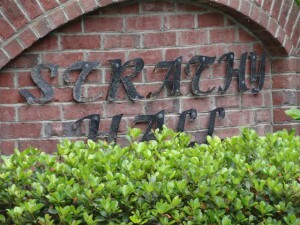 Strathy Hall is also on the National Register of Historic Places. With it's prolific history, Strathy Hall comes with an unparalleled natural beauty. It sits in a grove of majestic live oaks on the Ogeechee. The estate is surrounded by impressive magnolias that date to the 18th century. With the final phases of this subdivision having been completed, there are beautiful well-appointed resale homes available here. Are you looking for a place with majestic scenery? There are many ancient oaks around Strathy Hall that were planted around the time that General William T. Sherman attacked the original plantation house. Strathy Hall has such old southern appeal that even Henry Ford made it his winter home. Since the climate here is temperate, Strathy Hall has a community pool and clubhouse to cool off on the hot summer days. It is only five minutes from historic Fort McAllister State Park and 25 miles from downtown Savannah. It is located in the Richmond Hill area. A quiet family community, Richmond Hill has excellent schools, a coastal location and a rich history to it. It is also 20 miles from historic Savannah. Being close to Savannah's business and entertainment opportunities contributes to Richmond Hill’s reputation as a great place to live. We hope you will check out the houses for sale in Strathy Hall and experience the old southern appeal of this neighborhood. Feel free to contact us if you have any questions.